It's Saturday, and my fingers and arms are still sore from the vicelike grip I held on my ambu bag, furiously trying to push oxygen into my patient's lungs during Monday's laryngospasmic* moment-of-sheer terror, a complication that every anesthesiologist eventually comes to know and dread. There are no words which adequately describe the intense tangle of fear, desperation, and adrenaline involved in a resuscitative effort. What just happened? What IS happening here? Time orientation is the first of your capacities to crap out on you. Seconds and minutes feel like hours, no...eons. Everything in your immediate surroundings becomes surreal, and you feel strangely removed from the experience, as if it's all just a bad dream and you're not really there, watching Life circling the drain as Death--adorned in her signature cyanosis and pallor-- taunts you, shrieking with obscene delight at the folly. What are we missing? What should we try next? With a mind-numbing array of algorithms swirling wildly through your head, you realize you are praying to someone, anyone, Please don't let this patient die. You're vaguely aware of a nurse's voice. It's the same nurse you were joking with about a new-fangled CPR machine just an hour or so before this event, only now she's solemnly delivering ominous news about your patient's heart rate and blood pressure, both of which are bottoming out. Oh my God, this patient's gonna die if we can't oxygenate! "Would you like me to give some epinephrine?" she queries, as you're sliding a breathing tube into the patient's trachea. "Yes, that'd be great. Can someone push on this lady's chest to help the epi circulate?" In the meantime, helping hands are flying every which way, with everyone around that stretcher intently focused on thwarting life's premature exit, communicating only through objective observations and simple direct questions. It's a realm we don't often see in medicine, a place where egos temporarily evaporate, where we're all clearly on the same page, Please don't let our patient die. Circulation. Airway. Breathing. Suddenly, the black clouds part, yielding a singularly auspicious ray of thank-goodness-I-think-she's-gonna-make-it. Dare I exhale now? Your monitor has abandoned its lento doloroso of constant physiologic alarming in favor of the reassuring allegro vivacissimo of restored ventilation and perfusion. O bless you, Almighty Oxygen! Lips and nailbeds that were blue are now pinking up. She's swallowing, and fighting the tube...YEAH!!!!! Once again, you've managed to triumph over death, but for physicians like you who remain unafflicted by the deceit of over-confidence, arrogance in the face of victory has an uncommonly short half-life. Did I just get lucky? After talking with the patient's family, you sort out and document the details of the code blue using a fine-toothed comb, thanking everyone again for their help before making the solitary, silent drive home. You beat yourself up pretty thoroughly in the land of Hindsight Is 20/20, thinking of all the things you could've-should've done differently, pondering this roller coaster ride that is your chosen profession, contemplating whether it's time to finally throw in the towel. What on earth possessed me to become an anesthesiologist? Emotionally and physically exhausted, you make yourself a grilled cheese sandwich, still coming down from the catecholamine-fueled sequence of hair-trigger decisions and interventions which enabled you to save your patient's life. Why can't I gloat about this? Am I being too hard on myself? You know it's going to be a while before you feel "normal" again. Maybe a nap will make everything better. I just want to forget. Before you lie down, you recap the whole scenario online with your good friend, Todd, who also happens to be an anesthesiologist. You trade mutual tales of disillusionment; he understands precisely why you want to quit. "We all get burned at some point in time," he observes. "What makes you a great doc and the precise reason you should stay in medicine is because you DO care. The same thing that is killing you right now is what makes you an ideal physician. Yep, it's stressful, but you're damn good. When our patients 'do this' to us, they need us and we need them. You're a damn good doctor, and you need to keep at it for their sake. You totally made a huge difference today because you were there...you were experienced and you knew what to do. Don't give it over to the other people in our field who don't care." Finally, I feel validated. Todd is absolutely right. It's not that we care too much: we can never care enough. This is what separates us from those "other people" who view medicine primarily as a means of making money, instead of an altruistic endeavor. Booksmarts and a God-complex will only carry us so far in this profession, whereas benevolence, intuition, and impeccably honed skills offer real redemption. Donning a white coat symbolizes our ethical obligation to our patients, but all too often, it's worn as a shield of conceit. Paternalism still runs rampant in medicine. My own son, who was just discharged from the hospital after being treated for a cystic fibrosis pulmonary exacerbation, remarked disparagingly, "None of my doctors really seem to listen to me." For someone with a chronic illness, that's a sad state of affairs, one that embarrasses me as a physician. We've chosen a difficult vocation, made even more so by the fact that people like Todd and I care so deeply about our patients. Doing the right thing hurts sometimes, and yes, we all get burned. It's strange to think that five days ago, I saved my patient's life, a feat which I still don't view as being particularly extraordinary, certainly nothing worthy of anyone's admiration or exultation. It's simply what I do, and believe me, I had a lot of help. I no longer sport a white coat, having traded it in for scrubs many years ago. Today, I'm clothed in a not-so-invisible armor of compassion and humility, outfitted with the accoutrements of patient advocacy, the true trappings of my craft. I sometimes just need to be reminded that I'm good at what I do. 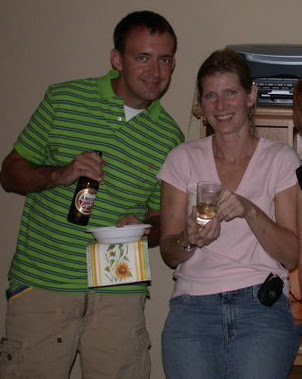 Todd & me in 2005, at my surprise house-warming party. We survived Emory anesthesia residency together. *laryngospasm: a life-threatening involuntary spasm of the vocal cords, usually triggered by mucus or saliva, which temporarily restricts airflow into the lungs. Some doctors really don't get what their job is about. Sounds like you do. Hope people appreciate it. ascending arpeggios are good. Todd is great. Love you both. Mike, that is SO weird...I almost used "ascending arpeggios" instead of "allegro vivacissimo." Great minds think alike! It was SO good seeing you at Emory the other day...XOXOXO. I always look forward to your posts, but this one really hit the mark. It's such an unusual relationship Doctor/Patient. The more you go through together the more you understand each other. My Reproductive Endocrinologist went on a very long journey with me so we built a different relationship than I do with almost any other Doctor. Most of the time I wonder if anything happened to me or if I were misdiagnosed, would I just be a blip on that Doctor's radar? It's nice to hear that with some Doctors it matters more than we, the patients, can tell. Karen, as the parent of children with a chronic illness, I can relate to wondering about them being seen as nothing more than a blip on the radar. It's very powerful motivation for me to get to know more about my patients than what's on paper, to treat them as fellow human beings, not a diagnosis. I am so grateful that there are caring people like you in this world. I am sure that your patients and their families are grateful, too! Keep up the great work. I am sure that you have inspired your fair share of newbie doctors and maybe some of your talent and wisdom has rubbed off. Thanks, Melanie...I was hoping to capture the feeling of those moments of terror...so difficult to put into words! Toddles, What would I have done without you on Monday?! You'll never know the impact of our conversation that afternoon. Love you! Thanks for sharing your story. My mum was a nurse at the U of Penn Hospital on a surgical floor when I was growing up. Your story in many ways helped me really see why she did what she did and why she often got so emotionally involved in her patients' well being. Having spent time in hospital myself, I have a great deal of respect for those of you who keep the "care" part alive for us when the doctors can often come across as lacking that vital skill. Kevin, I imagine there were many days when your mum hugged you extra tight when she came home from work, and you had no idea why. She'd probably had an experience like the one I described here. Seeing our loved ones after such an ordeal makes us appreciate our own lives all the more. I was totally locked into this post. Gripping. I find it very refreshing and reassuring to hear how you take your job so seriously and care deeply about your patients. That's how people in your profession should be, but it's clearly not always the case. Some doctors etc need to step aside and allow others to take over and do a far better job. In the past I have been in hospital many times and on numerous occasions felt like the doctors, consultants didn't give a damn. They stride about in the their white coats making decisions whilst at the same time ignoring the patients fears and concerns and we are not always in a position to argue our case, but we have feelings too. Helena, yes it's stressful and you are dealing with life and death on a daily basis, but it's people like you that makes the difference. It's people like you that the next generation will learn from and look too. Keep up the excellent work. I hope your son has got his condition under control now as was wondering how things went. Kris, it's clear that you bring the utmost care and attention to everything you do, from your writing to your parenting to your doctoring. They and and we are lucky to have you. Great post, Kris. It really does take someone special to do the job you do. I'm proud to know you! "I sometimes just need to be reminded that I'm good at what I do."